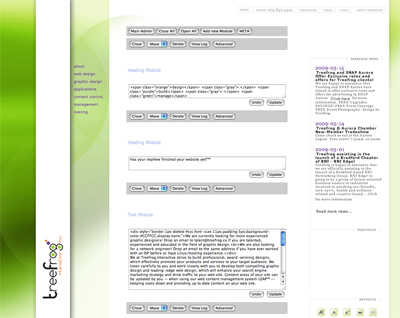 LEAP™ is a Content Management System (LEAP CMS), yet so much more than this. Because of its wide range of features that go beyond content management, it is also referred to as a Website Operating System. LEAP™ is created by and is maintained, supported by Treefrog Interactive, and is used to run and manage websites around the globe. Be your own technician – LEAP™ challenges the way businesses have operated websites to date. Websites have traditionally been seen as online brochures that are rarely updated and only with great expense. Updates seem to be only for those with the time, money and energy to spend. We allow businesses to integrate their websites into their marketing plans as an effective communication and selling tool. It is effective whether you have one person to manage your website or a full marketing department. Some larger companies will hire IT or design personnel to manage their websites. Communication between the marketing and IT departments can become inefficient and money or time is often wasted. instantly, and the editable area is defined and dynamic. Ask yourself, how much do I really need a website and how will it draw sales enough to offset the costs of maintaining it? Your new LEAP™ website truly is a marketing tool. Whether the president of the company or a staff of 10 are running your sales platform, this system is designed to allow anyone to maintain a perfectly current site. Do you have a sale on this week? A new product you are selling? A seasonal message to spread to your online business partners? A new phone number or staff hiring to announce? These little changes occur all of the time. Now you can keep your site up to date without depending on a contractor for timely service. No waiting, no hourly update costs, no mistakes. 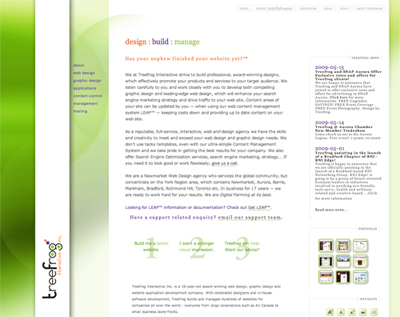 Manage your website the same way you manage your business. Check out a quick demo & then Request your own demo today!